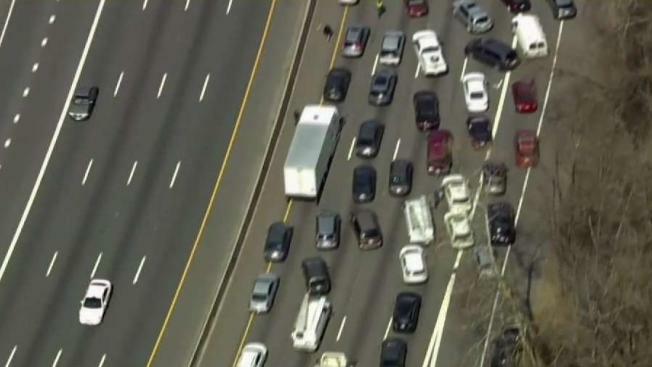 Drivers in the Washington, D.C., area were still experiencing the ripple effects hours after a tanker truck overturned and completely blocked the northbound lanes of the Capital Beltway at the American Legion Memorial Bridge. The crash closed the road for about 12 hours until it was reopened about 2:30 a.m. Friday. Go here for the latest updates. Three cars were involved in the crash with the tanker about 1:50 p.m. Thursday, Fairfax County Fire and Rescue said. The driver of one of the cars was taken to a hospital with minor injuries. Inner Loop traffic immediately clogged up after the crash and rubber necking slowed down drivers on the Outer Loop. Major roads surrounding the Beltway were at a stand-still by 6 p.m.
After 11 p.m., many drivers were still crawling along in the area of Virginia-123 and Chain Bridge Road. Sections of I-66 and Virginia-120 were also gridlocked. News4's Jackie Bensen reports some drivers decided to call it quits and pulled over to go to sleep on the side of Virginia-193. About 150 gallons of fuel spilled out of several leaks in the truck, but it was contained and kept from going into the Potomac River, according to Fairfax County Fire and Rescue. Crews had removed about a quarter of the 8,500 gallons of fuel from inside the tanker just before 9 p.m. Fairfax County Fire and Rescue said it will likely be another couple of hours before VDOT could work on getting the tanker upright.